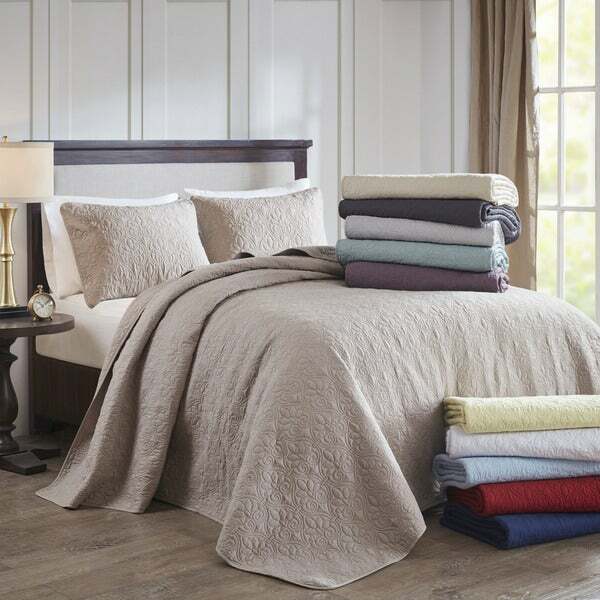 Madison Park Mansfield Reversible Bedspread Set is the perfect bedspread to use as a layering piece or an alternative to your comforter for a new solid look. The classic stitch pattern pairs easily with your existing decor and will sure to add a new decorative element to your bedroom. The bedspread has 100-percent cotton fill while the face and reverse are a super soft brushed fabric. Dimensions 110.0 In. X 81.0 In. X 0.25 In. This quilt is soft to the touch, very much like a woven cotton. The stitching and quality of the thread looks excellent, we'll see how it holds up over use and washings. It's light weight yet comfortable on a chilly night with a blanket. I purchased a king (Ivory) and the size is ample, the drop on each side is 22" and up to 38" at the foot of the bed. This extra length allows me to tuck and wrap the spread around our bed pillows at the head of the bed mimicking shams. I may not even use the matching shams. I would compare this quilt to a much more expensive product elsewhere. For those of you debating on what shade/color the spread actually is go to your local Sherwin Williams and pick up color sample SW 7013, Ivory Lace. My spread is a perfect match to this color sample. Hope this is helpful. It is gorgeous and looks to be of great quality. Yes, it is on the thin side, but it is heavy. I purchased the ivory queen set. It is not on the beige-tan side but not white either. Slight, slight hint of yellow (barely), but not yellow, if that helps your decision. It actually is a perfect match for the beiges/oatmeal and taupes and whites I have going on in my bedroom decor and suits my French cottage style. I will say that the spread is definitely oversized, as the listing indicates. I didn't measure my bed before placing my order. I just know that full/queen is usually a little bit short for my bed. Looking at the dimensions of the full spread now, the full size would have been perfect, if there were zero chances of shrinkage. I switched this queen spread around a couple ways and it is six inches too long on the shorter sides (horizontal) of my bed and perfect from the top to the bottom of the bed and hits the floor. If I switch it the other way, it is a good 12 inches too long vertically and doesn't hit the floor on either side (horizontally) on my bed. I don't know if I would have this issue with a newer mattress and box spring or if the spread will shrink. If the spread shrinks any, I am covered. If not, I love it so much that I am keeping it anyway because I can work with it. I will keep using a bed skirt regardless. Well worth the money. Bonus that I had a coupon for 20 percent off and free shipping. Arrived within a couple days of placing my order. Very, very happy with my purchase! This quilt is really nice and is definitely oversized - check out the dimensions! I wanted something for our guest room Queen-sized bed that would cover the deep mattress and standard box spring and eliminate the need for a bed skirt. Previously I had used a standard King-sized quilt but that wasn't really wide or long enough to do the trick plus then I was stuck with King-sized pillow shams that didn''t fit! This Queen quilt set solved the problem and it looks great. 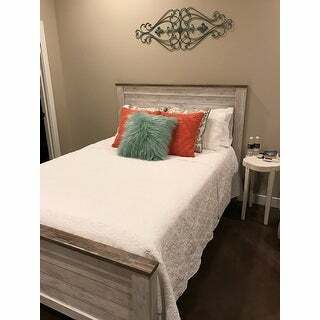 The sides hang a couple of inches off the floor and it's quite long so you can tuck it under the pillows and still have plenty of length to cover the foot of the bed. I got the light grey which is lovely. I love this bedspread! It is so perfect for summer time, it's not too heavy. This is my first oversized bedspred and not my last. It looks great...all three sides come to the floor and at the corners there are at least 2 inches extra. It looks awesome. I have a queen and bought the queen size. And the price was a steal...I looked around at other sites and it was almost 2x more expensive! I should get another now that I think of it! :) love it!! What a terrific find at a great price. This is exactly what I was looking for. I have a king sized bed and I have a love hate relationship with bed skirts mainly because the last one I had caused the mattress to slide everywhere, all of the time. The skirt was always uneven and I stepped on it more times than I can count. I threw it away vowing to not use one again. My comforter is worn out so I decided to look for a bedspread this time. I needed one long enough where I wouldn't need a bed skirt. I searched many stores and the measurements just were not large enough for my bed. I came across this one at Overstock.com in blue, it would match my beach themed bedroom perfectly. The measurements seemed larger than normal so I decided to try it. I received it today and immediately tried it. I have thick mattresses and it is a pillow top. The bottom of the bed frame is 7 inches from the ground, the box springs are 9 inches tall and the actual mattress is 13 inches tall. This bedspread almost touches the floor on all three sides. Best part: no bedskirt needed!!! Very pleased with this bedspread. GREAT quality. A little heavy just the way I like it. Buy it! You won't be disappointed!!! Very BIG, Nice Quality, Nice Ivory color. I bought the ivory and I think it looks like ivory, not cream like some reviews mentioned. I love the color and think it looks classy and good quality. - Pretty much looks just like the images. Not too thick and hot, not too thin and cheap at all. - Nice medium weight. I washed/dried in dryer once before use and it is very large on my king bed. 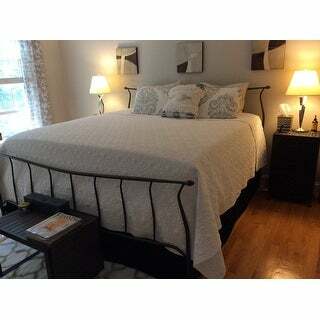 I bought the TRIBECCA HOME Bellwood Victorian Iron Metal Bed with a standard box spring and a thick 14" mattress. If I arrange it so that it almost touches the floor at the end of the bed, there is still at least 5-6 inches of overhang at the head of the bed. On the sides, it just covers the side rails completely. At the corners, it actually hits the ground as it does in the image. Kind of funny, I have never been able to find a bedspread that is long and wide enough for a king. - They are always short somewhere and I have to say that this one might be a little too long. I will have to wash it a few more times though before I complain too much. Overall, very happy and keeping it even if it is on the long side. Our bed sits 6 inches off the floor as it is, then a 12 inch box spring and an 18 inch mattress so we really needed an oversized or else it just looks like it doesn't fit and we end up fighting over the covers all night. Well this one fits so well, it hangs to the bottom of the sideboards on both sides. Perfect. Love the Seafoam color as it is not really seafoam but more of a SpaBlue they call it. Which is what we wanted. It is perfect for cool Texas nights and when we have the AC on! This is very nice and the larger size is perfect for a king bed . It leaves about 8-10 inches to the floor and I have a very thick mattress (maybe 18-20 inches). BUT the ivory is not creamy it has a LITTLE yellow tint to the ivory. It is not "heavy" (something you would need for winter) but it is still a substantial weight. I would say its a medium thickness in this type of cover. Its says it is poly and the filling in cotton, but it feels like its all cotton. Love this bedspread! Exactly what I was looking for. The color is an ivory, but extremely soft and extra long. I had been searching for an extra wide bedspread, and this one is more than wide enough! 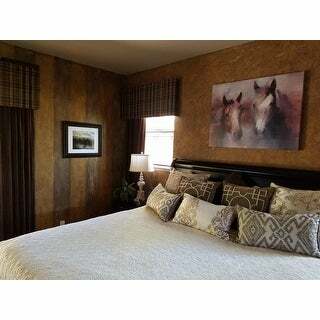 I love matelase and assumed from the photos that the king size bedspread would skim the floor on all 3 sides. Not the case. It only drops to the top of my metal bed rails. This would be fine if I had a wooden bed frame but I don't, so it looks ridiculous. Now I will need to purchase a king bed skirt and I'm not sure how that will look. The quality and color of the fabric is wonderful however, the size disparity is disappointing. Not "Off White" - Definitely "Creamy"
I rated the bedspread only 3 stars because: - The color is not "Off White" as described on the Overstock website--but is definitely an unappealing "creamy" color. The "Off White" color is very important to me and was the reason I made the purchase. - To me, the overall quality is average. - I purchased the bedspread for my king size mattress with an average pillowtop. I paid attention to the measurements and reviews, but still the "bedspread" is short on the sides and is not suitable without a bedskirt. It looks like something between a coverlet and a bedspread. After washing it, I'm sure there will be shrinkage and it will be even shorter... I was hoping to finally find a real "bedspread" length that would touch the floor on all sides. This is not the case for me. 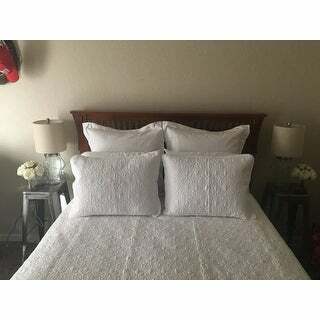 This Quilted bedspread set is exactly what I wanted and exactly what it appears to be in the photos. I purchase the full/queen and have it on a queen bed. Doesn't quite go to the floor, but close enough for my liking. I have a 22" inch high mattress. This quilt was so wide, that it covered evenly both sides of the bed. No more "short side" and the material is fantastic. I love it. Highly recommend for extra deep pockets and oversized king mattresses. It feels luxurious. Did NOT shrink when I washed it (I wash all new items). Not one bit. It's great and still shows my bedskirt. For me, it was never meant to touch the floor. This quilt is nice. I bought the king size for my split king adjustable bed and was hopeful it would reach the floor. It doesn't. You can tell where additional fabric was attached to make it as large as it is - something I don't like. Exactly as pictured, soft, washable, oversized. Very happy with purchase. this is a very nice bedspread...we love it!!! Very satisfied with this product would recommend to a friend. I love that it’s bright white. It’s so soft and versatile. It really Looks great with any decor and transitions nicely from season to season. There are decorative pillows sold separately that I was able to find. Beautiful Color looks just like picture. 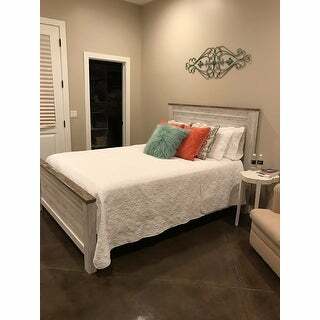 It is very light weight, which i wanted and hangs all the way to floor as pictured on our king size bed. nice stitching too. Wow! What a fantastic quilt. I am gonna order another one right now. It is super long and touches the floor. I have a tall bed and always have trouble finding something that fits. If you have a queen get a queen. No need to go up. Love the color, pattern, quality and it's the perfect size! The size was perfect for this sixe of bed! "Is the sea foam green a dark shade or light"
I purchased the Grey bedspread, so I am not able to respond to your question. It's a light shade of green. "what is the dry weight of the coverlet?" That is approximately 9 pounds. "Are the shams euro size?" 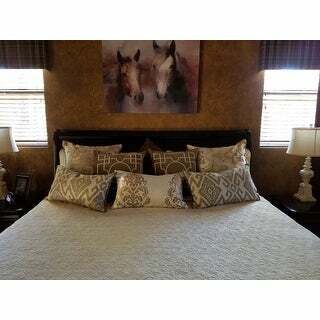 The shams are 20 x 26 and 20 x 36 for the king size. I hope it helps. I bought the king size set. The shams fit king size pillows, not euro size. "I don’t see the grey as an option in any size. Either available or sold out. I’m interested in the king grey. " If you click on the arrow underneath the picture where it is shows the colors available, a grey one comes up. I purchased the king spread, It is a light grey more a silver grey very pretty. "Is there a seam in the face fabric on the King size? If so, is there more than one seam? I think I can see a seam along the left side of the bed... Are there seams on the face fabric on BOTH sides of the bed in the King size? Or is the face of this bedspread seamless? Details, please!" As a matter of fact, there are seams down both sides of the quilt. I had to go in the bedroom and examine it to see them. Mine is white king sized and I never noticed the seams before. This is a beautiful quilt about mid weight and the seams blend very well in the design. I love that it is oversized and washes well too. I just washed it last week and didn't notice the seams even then. I am thinking of getting another. If you're asking if there is a seam, piecing sections together, mine doesn't have a seam. I have a King size. It is a great size for me and drapes well over the sides of the bed. "What is weight of the king bedspread?" It is a midweight quilt. "Actual size of king size, please?"